Evolving to cope with the new trends in land warfare, military forces around the world transform heavy armored and mechanized forces into agile formations. Trading off their main battle tanks for lighter, faster, and much more versatile elements, armies are utilizing 6×6 or 8×8 wheeled or medium weight tracked combat vehicles that better fit for hybrid warfare. Equipped with different mission systems these vehicles are assembles into combat teams, utilizing effective firepower and mobility to achieve their mission. The weapon systems associated with those teams include high rate 30 mm guns, missiles, mortars, and remotely controlled weapon stations (RCWS). These concepts become popular with many NATO members and other countries modernizing their armed forces, that need to phase out obsolete tanks and Armored Personnel Carriers (APCs). By fielding modern vehicles, they stand up rapidly responsive forces that meet current challenges and fully adapt to NATO standards. Tracked vehicles, lighter than tanks, and wheeled vehicles prove to be more affordable, agile and adept to the road and transportation infrastructures of developing countries. Those armored vehicles are based on platforms originally designed as troop carriers. They transform into highly potent combat vehicles by adding by a complex array of mission optimized weapons and systems. Advanced, offensive and defensive weapon systems, complemented by sensors, active protection, command, control, communications and networking make up those combat vehicles. Most of those systems are grouped in the turret, around the main weapon systems. 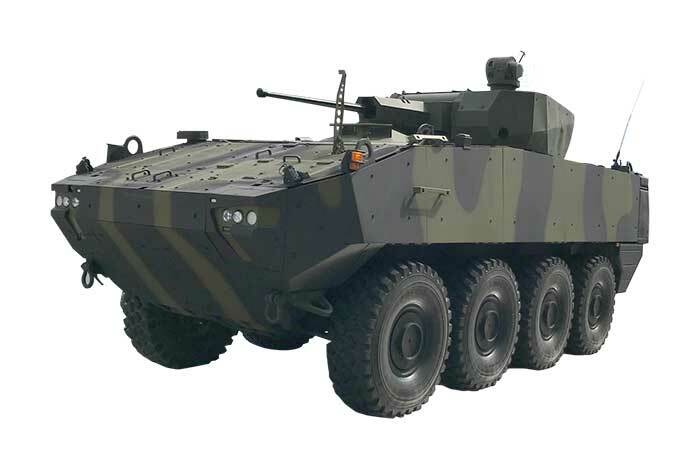 Elbit Systems’ UT30MK2 is a configurable unmanned or manned turret that can be supplied in any protection level,adding highly effective firepower to APCs without compromising troop safety. Firepower, optronics, warning sensors, passive and active defenses, all benefit from integration onto the turret. Moreover, a spacious and modular turret such as UT30MK accommodates the ballistic computers, electro-mechanical weapon and turret controls, and other systems on the turret, thus saving space in the fighting compartment, adding to integration efficiency and modularity and reduces development risks. Read more: Corporate wars: Who will deliver the most accurate missiles to the Israeli army? Elbit Systems’ Land Systems is positioned as one of the most experienced providers of integrated turret systems. “We gained extensive experience through decades of evolution, development and modernization of combat systems for Israel’s Merkava Main Battle Tanks (MBT),” said Maimon Ifergan, Vice President, International Land Systems at Elbit Systems’ Land and C4I Division. “The knowhow acquired with tanks turrets has been scaled down to 30/40 mm and implemented in the new turrets developed by the IDF for the Eitan and Namer combat vehicles. Representing our latest turret design, UT30MK2 was successfully integrated in the new and modernized combat vehicles, both tracked and wheeled.” Ifergan noted. “Apart from the technical functions of remotely controlled weapons, our design implements extensive experience in crew station design, human machine interface, fire control and weapon stabilization, providing intuitive and efficient operation and support for complex functions such as ‘hunter-killer’ functionality,” Ifergan added. This capability is utilized by providing independently stabilized and interconnected sights for the gunner and commander, enabling the two crewmembers to engage separate targets simultaneously. Based on the extensive experience gained in numerous modernization programs worldwide, the company provides complete solutions integrating weapons and systems. The legacy of AFV weaponization programs includes projects undertaken throughout NATO forces, as well as with customers in Asia, Africa, North and Latin America. 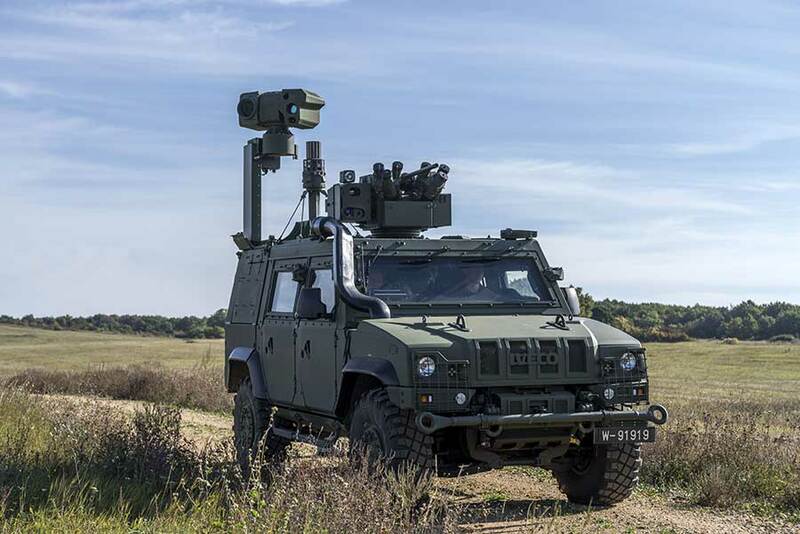 Providing turrets and combat systems for NATO members, Elbit Systems cooperated with all leading vehicle manufacturers. In addition to the Israeli Merkava, Namer and Eitan, among the vehicles currently installed with combat systems and turrets from Elbit Systems are the European GDELS Pandur and Piranha, Iveco LMV, Patria AMV, the KMW Dingo and BAE Hägglunds BVS10 and other 4×4 platforms of central European countries; the US Stryker; Iveco Guarani in Latin America and M113 in Asia Pacific. 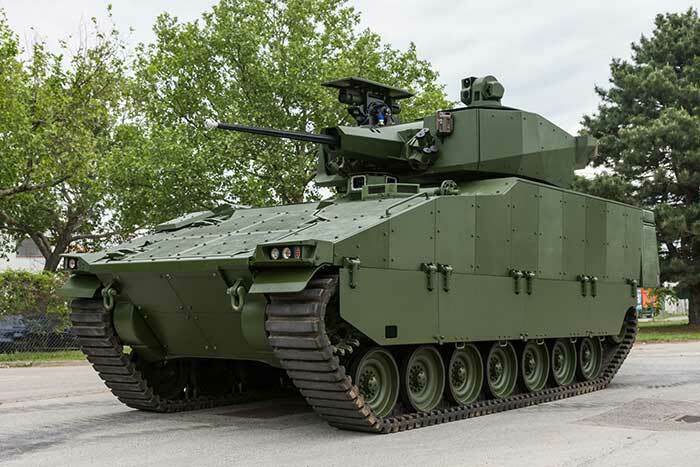 This versatility is derived from the UT30MK2 modular approach that enables customers and manufacturers to adapt the turrets they order to best meet the vehicle’s characteristics and operational requirements. 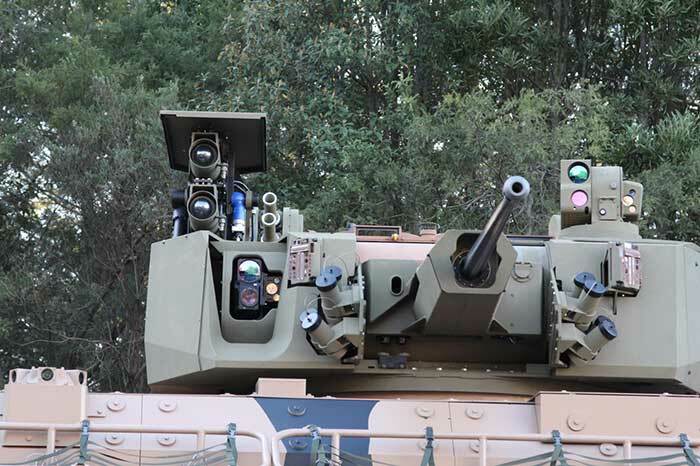 The turret’s modular design enables customers use manned or unmanned turrets, addressing different operational considerations. Both designs place on systems, including electronic controllers, and loaded ammunition in the turret, clearing valuable space in the hull. The unmanned turret is attached without penetrating the hull. The manned version differs from its unmanned sibling by the added turret basket, seating two crewmembers, commander and gunner, side by side, below the deck for added protection. Designed with a low profile, the UT30MK2 encompasses a broad range of weapon systems, countermeasures and advanced electro-optics, to deliver reliable, high performance firepower to the battlefield. The turret integrates a stabilized Northrop Grumman/ATK MK44 ABM 30/40mm automatic cannon, coaxial machine gun with precision levels providing the highest first-round and burst hit on the market. As customers often opt for a family of vehicles to equip combined task forces, Elbit Systems provides other weapon system configurations including light remotely operated weapon station (mounts 40mm automatic grenade launcher, .50 Cal heavy machine gun (HMG) or 7.62 light MG). Other systems include a 120mm self-propelled autonomous mortars providing ‘pocket artillery’ for battalion commanders. The armed scout configuration benefits from elevated mast mounted sensor pack comprising radar and observation systems providing tactical intelligence surveillance and reconnaissance (ISR) for the unit. The UT30MK2 implements extensive knowhow and operational experience of company’s engineers, most of whom are also serving in the IDF reserve. Offering a fully integrated product that includes many systems developed in house, Elbit Systems can ensure work-share and high levels of maintenance capabilities and share technology with its customers, supporting local manufacturing, training and continued through life support.